Philips BT3500B review | What Hi-Fi? For the money, the Philips is a great, affordable way to go wireless, with excellent sound quality. We wouldn’t normally accuse a product of lying down on the job, but we’re making an exception with this wireless speaker. The Philips BT3500B can stand either on its edge, or you can flip out its kickstand and lay it down in a shallow recline. This way it fires up into the air and encourages a bigger spread of sound, while also removing the fear that it could topple over. The only slight downside when it is in a near-horizontal position is that music loses a little precision and focus, but if you’re more intent on filling a room with sound, then it’ll do the job just fine. Other aspects of the speaker’s appearances are pretty unspectacular. The only real accent of note is the silver dial tucked in the upper right-hand corner of the unit: you rotate this dial clockwise or anti-clockwise to change volume. On the top edge of the Philips is a slider switch, which flicks between Bluetooth mode and the 3.5mm auxiliary input. There’s a button next door, which either starts the pairing process or ends any phone-call taken through the built-in mic. Another step along is an NFC logo, for an alternative way to pair a smartphone. The built-in battery is charged using a micro-USB cable, which comes supplied in the box. Battery life is only five hours, which is disappointing considering some rivals can offer double this. Stream a few bars of The Clash’s I Fought The Law and the Philips rocks along enthusiastically. Drums and handclaps have pep and vigour, electric guitars have just the right amount of edge. There isn’t quite the clarity or outright detail in the mids and highs that you would get with some rivals (such as the Roberts Travel Pad), but the Philips offers a slightly fuller, more rounded sound. Play Kanye West’s Black Skinhead and the bassline is tight and well behaved. 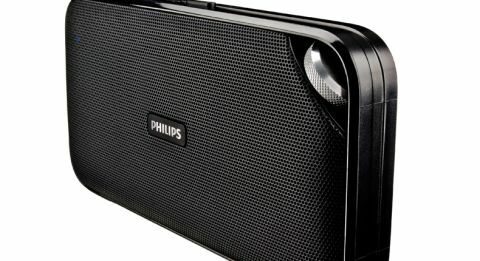 We’d like more from the built-in battery, but the Philips BT3500B Bluetooth speaker hits the spot with the time it has got, thanks to its all-round sonic ability.